I had long heard about not only the artistic brilliance of Yoshitoshi ABe’s creation–something I certainly would believe given that his Serial Experiments: Lain is one of my favorites as well–but also about how, more than any anime, this grapples directly with theological themes in a cogent and relevant manner. Of course, I had heard the same of Evangelion, and while that show succeeded on many other fronts, it was a hollow shell when it came to religious symbolism and significance. This one comes much closer to dealing not just with ethical issues, but with the meaning of such concepts as creation, sin, salvation, and forgiveness. Indeed, all of these key theological ideas are handled directly at some point in the show, though, as it turns out, an actual god or even a messiah figure is relatively peripheral compared to how these ideas work themselves out in the characters’ lives. That the exploration of these ideas remains deeply rooted in the stories of the characters, particularly Rakka and Reki, and is moreover generally clear, is a sign that ABe has thought these ideas through. CS Lewis once wrote that if you can’t explain a difficult theological concept (or really, any difficult or abstract idea) into ordinary language, you haven’t really mastered or understood it. (He proposed as an ordination test that a prospective minister translate a work of abstruse theology into layman’s terms.) In fiction writing of any kind the emphasis must be on concrete human (or in this case, Haibane) detail. I sense a similarity in the approach of Haibane Renmei to that of Kaiba, where the speculation about the mind/body relationship is never far from poignant, emotionally charged stories. Actually, the two shows also share a mood of quiet melancholy in many places, a mood that is done well by so few anime–the only other show I can think of that mastered this was Mushi-shi. Much of this is through the beautiful soundtrack, filled with expressive strings, not to mention the terrific OP instrumental. The animation is gorgeous, to boot. The character designs are immediately recognizable as ABe’s, of course–from Lain to Niea_7 to the cover of Welcome to the NHK!, his girls in particular are easy to pick out. They are cute without being moe. Plus, the town of Glie, though we never leave it, is a work of beauty and character in itself. 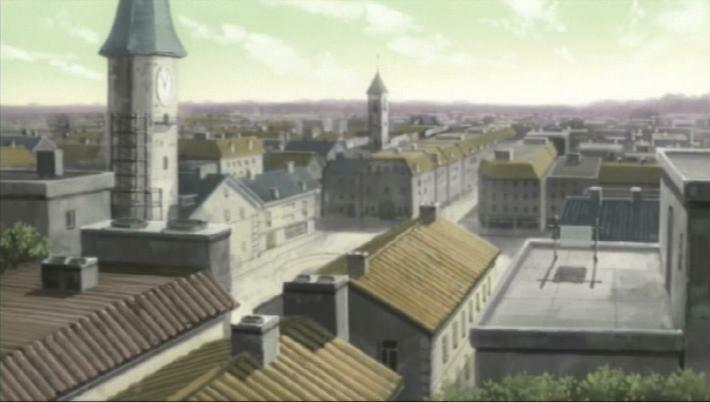 There is the Western Forest, the Temple, the Old Home, the Clock Tower, and even the space inside the Walls; each has a very unique look. The omnipresent wind generators, which powers a modern-yet-medievalish town, stick in my mind too. I was not surprised to learn that in its origins as a doujinshi, ABe conceived of the world before he thought of characters or a story. Middle Earth more or less was developed the same way by Tolkien. Though it is a walled town, Glie not only feels complete, it serves as an effective microcosm of the whole world. 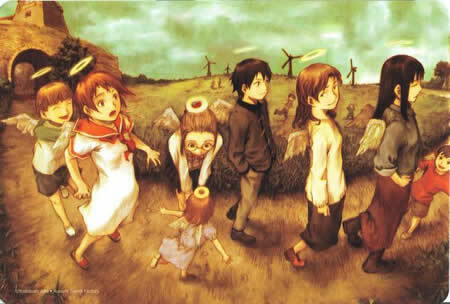 While I was curious as to what was outside the walls, just as Rakka and the other Haibane were, I did not feel tremendous dissatisfaction that we never saw what was outside by the show’s end. The town itself felt big enough, but with the suggestion that so much more lies beyond–just like our world, really. Inhabiting the world are some of the most charming characters you will meet in anime. Rakka and Reki are the central characters, of course, who serve as good foils to one another. Both give emotionally honest and resonant performances, particularly in later scenes where they must deal with grief, loss, and self-loathing; but Rakka’s innocence and Reki’s wry humor and experience make them likable as people. The side characters, especially Nemu, Kuu, and Hyoko and Midori, also play crucial roles in the lives of these characters, especially as we learn more about them. The world of Glie seems so charming and pleasant at first, particularly when seen through Rakka’s initially sunny disposition, and it is through these characters that we get to see more dimensions to to both the people and the world they inhabit. In the end, the story makes the viewer care deeply about the emotional and spiritual well-being of Rakka and Reki, which means that sorrowful scenes and scenes of intense emotional struggle feel fully “earned.” Rarely is the show melodramatic. It also helps that there are deeply resonant symbols that accompany the show’s action, and the resonance is used to brilliant effect–the Wall, the halos and wings, cocoons, the stepping stone to the Day of Flight…none of those things have only one meaning, and yet they are still meaningful as archetypes and as polyvalent symbols. The show might start a bit too slowly for some. I admit part of my long delay in completing this show was the relatively sedate first three episodes, which contained plenty of unique elements but wasn’t deeply compelling at first. Some may also find fault with the lack of final explanation for many of the key concepts, places, and people in the show, but in my forthcoming theological look at the series, I will explore why I think this is a strength rather than a weakness. (It’s not for the usual BS reasons that many people use for such things in anime, either–it’s directly tied to what kind of story this is.) Some of the characters also look gender-indistinct; I had to remind myself that some characters who looked like boys were actually girls, like Kuu, and this can be potentially confusing. These are, however, relatively minor issues if one is willing to take the journey all the way to the end, which I found richly satisfying and moving on both an intellectual/theological and emotional level. That it does so coherently is rare in anime; that it does so with few of the usual cliches (romantic hijinks, fan service, artsy abstraction) is even rarer. I’m glad I picked up this show on DVD before Geneon went under and thus become out of print; it’s a shame that it was not one of the titles “rescued” by Funimation this month, because it deserves to be seen by a wider audience. Highly recommended. Animation: 90%. Not only is the visual look of the characters and the world superb, with again the caveat of similar-looking boys and girls–I noticed that the credits list only Japanese names among the animators, even for in-betweeners. In other words, it does not appear that the animation was outsourced anywhere else, which is sometimes the cause of inconsistent animation. It showed; I never noticed any lapse in the quality of the animation. I take it that this is also exceedingly rare in today’s anime. Music: 85%. Like in Kaiba, the quiet, strings-based soundtrack helped to create the gentle melancholy that I found so appealing in this show. Not all the melodies are memorable, though; most tunes remain in the background, with the exception of the OP, which is a vaguely Celtic-based melody that needs no words to express the joy and sorrow that the show contains. Voice acting: 88%: Rakka and Reki do a superb job, especially Reki’s seiyuu, Junko Noda. Both are required to express great emotional range and both pull it off superbly, which of course is helped by the strong dialogue and writing that is present in the show. The other seiyuu are fine, though again some of them really do sound like boys when they are playing girl characters. The only voice that sometimes sounded a little out of place was the Communicator’s, which I think is better suited toward a tinge of menace rather than the relatively fatherly, even occasionally pastoral, tone he is revealed to have later on. Story: 93%. I find the story intellectually rich and emotionally fulfilling. It made me think directly about sin, death, forgiveness, and salvation more than almost any anime. It also had me welling up with tears more than once near the end. The journey of life that the characters struggle to fulfill, from “fall” to birth to forgiveness to the Day of Flight, is such a resonant picture of life in mythical/metaphorical tems. A few points were deducted mainly to take into consideration that the lack of explanation of some elements might be offputting to some, and that the show takes a while to get started–which was an obstacle I myself had to overcome. But it was well worth it. Overall: 91%. An instant contender for “top five” favorite anime for me, of all time. It has dethroned Escaflowne as my favorite “fantasy” anime series. Previous PostStrike Witches TV series 03 – this is why today’s anime has no soul!Next PostDo you really want to watch this in real life? Did you ACTUALLY See Street Fighter the Movie??? 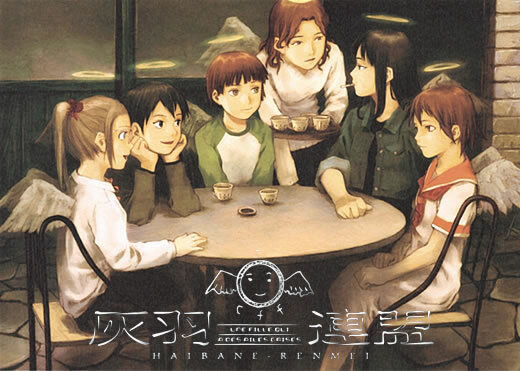 On the other hand, Haibane Renmei is ABe’s baby. But I’m not sure what you mean by artistic brilliance. Damn, if I’d known you hadn’t seen this until now I’d have recommended it to you earlier…what with your tastes and mine overlapping so often. I found the animation to be a bit lacking in places actually, but the artwork itself (and pretty much everything else) more than made up for that…it’s not much of an issue in a relatively action-free series anyway. I didn’t know there was no outsourcing done though – Radix aren’t a big name studio as far as I can tell, so taking that route is pleasantly surprising. I’ve read criticisms too of how the incidental details and side-characters weren’t explained enough but TBH it leaves a bit to the imagination (always good in a story that attracts thoughtful viewers!) and maintains the mystery that surrounds the world they live in. Besides, the main plot was addressed so well!